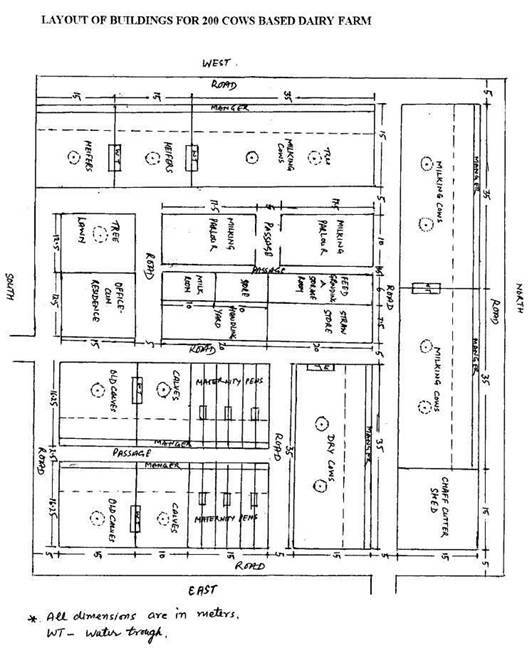 Model layouts for the construction of various farm buildings have been prepared under loose system of housing. The loose system of housing dairy animals has been recommended for most of the agro-climatic zones of the country with minor modifications except in heavy rainfall regions and the high altitude regions where winters are very harsh. The dairy animals under lose system of housing are grouped together based on their age in case of growing animals and based on their physiological condition when they are adults. The various categories of dairy animals may be formed such as milking cows, dry and pregnant cows, down-calvers, bulls, heifers and the calves. 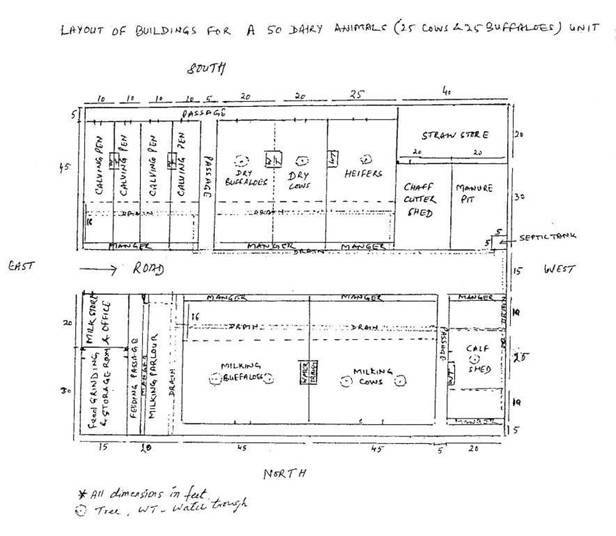 All these animals need to be housed in separate sheds and the provision in the layout has to be made accordingly. Apart from the animal sheds the certain other ancillary buildings/structures are also required to be constructed such as chaff cutter shed, feed store, implements store, straw store, milking parlour, milk room, silo pits and manure pits apart from the office, lawns. The large sized dairy farms may also need overhead water storage tank, a small sized workshop and parking space. The farm building may be arranged in such a manner that they result in higher animal productivity and labour efficiency with minimum movement of people and the animals. 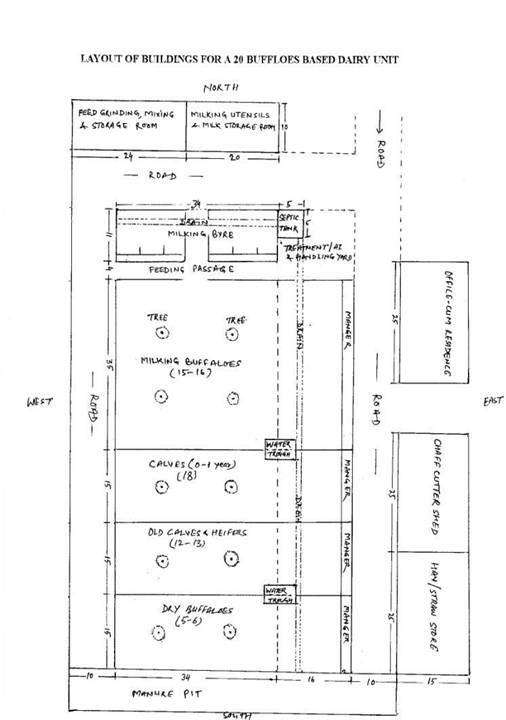 For example, the milking parlour may be situated close to the milking cows shed; the milk room may be adjacent to the milking parlour, the feed storage room also should be close to the milking parlour as the compound feed in mostly fed in the milking parlour during milking. The calf shed should be close to the milking cows shed if weaning of calves is practiced. The farm building should be constructed using cheaper locally available construction materials so that the construction cost is minimized. 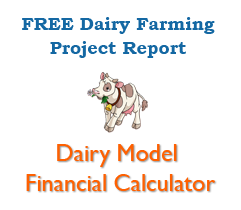 Given under are some model layouts of dairy farms of various sizes for the setting up of commercial dairy farms.